Sometimes I have to wonder about advice doled out by parenting magazines, newsletters, and websites. Some tips are so full of disclaimers it's hard to figure out if they're actually telling you something. "Start solids now. Or don't. But ask your pediatrician first, and ultimately do what's right for you." My pediatrician's nurse already gave me a little attitude when I called her last week about Olivia's cough. Me: Olivia has had a rattly cough for two or three days. She doesn't have any other symptoms. Should I be worried? Her: Is she wheezing or in respiratory distress? Her: Well I already went over "comfort measures" with you when you called in June. And then I defensively stammered that when I called in June it was about Olivia's stuffy nose, and not a rattly cough. 'Scuse me for not knowing they're the same thing. And imagine what it would be like if I actually did call them every time I was advised to do so by the parenting advice people. Once in a while I come across a real gem and wonder if anyone is editing the BabyCenter e-newsletters. "Taking a bath with your baby saves time and can be fun." Really? While I'm sure Livi would indeed love playing in the jacuzzi, how am I supposed to wash my hair since I am not supposed to leave a baby unattended in even an inch of water? Use the shower and just let Olivia play with the drain while I'm occupied? 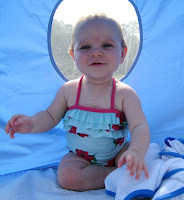 Speaking of water, Lauren and I took Olivia to the pool for the first time today and she loved it. Splashing, being splashed, dipping, jumping, the whole bit. 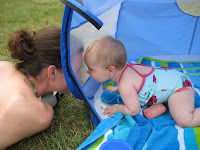 I brought a baby cabana because there isn't a shred of shade there, and that worked out well. I had gotten a huge LL Bean tote at the outlet last summer and never thought I'd actually fill it, but now I pack like a mom. Next thing you know I'll be driving a minivan. Horrors! 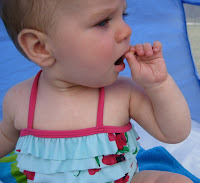 Anyway, the swim diaper worked great (thanks, Mary), we all got our RDA of vitamin D, and Olivia got to try banana Puffs for the first time. She's actually pretty good at feeding herself, but sometimes she'd grasp the thing in her palm and then stuff her whole hand in her mouth, then pull it out and wonder why it's still in her hand.